From Humble Beginning to Hero. The Soaring Spirit of Mississippi’s Ensign Jesse Brown. - Mississippi Believe It! Home » Resources » Campaign » From Humble Beginning to Hero. 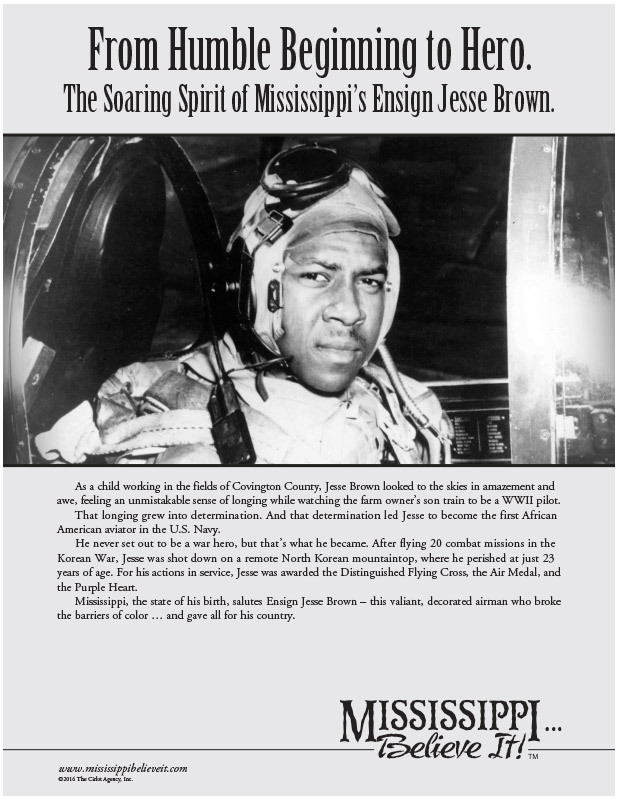 The Soaring Spirit of Mississippi’s Ensign Jesse Brown. From Humble Beginning to Hero. The Soaring Spirit of Mississippi’s Ensign Jesse Brown. As a child working in the fields of Covington County, Jesse Brown looked to the skies in amazement and awe, feeling an unmistakable sense of longing while watching the farm owner’s son train to be a WWII pilot. That longing grew into determination. And that determination led Jesse to become the first African American aviator in the U.S. Navy. He never set out to be a war hero, but that’s what he became. After flying 20 combat missions in the Korean War, Jesse was shot down on a remote North Korean mountaintop, where he perished at just 23 years of age. For his actions in service, Jesse was awarded the Distinguished Flying Cross, the Air Medal, and the Purple Heart. Mississippi, the state of his birth, salutes Ensign Jesse Brown – this valiant, decorated airman who broke the barriers of color … and gave all for his country. Plan to use the posters for educational purposes? Find out how to receive a set of Mississippi, Believe It!™ posters. Mississippi, Believe It!… was created for you… the people of Mississippi. The materials represented on this site were created to share little-known facts about our great state … and the people who make it great. Advertisers may download and run the PSAs free of charge. Corporations may use them to inform clients, prospects and potential employees about the wonderful state in which you have chosen to locate. Note: These materials are to be used strictly for informational and educational purposes. The images may not be used in any shape, form or fashion to create revenue, nor are they to be sold for monetary gain.